Q and I are wexpats - expats who came from western countries. And that essentially defines our "environment" long before we even landed in Abu Dhabi: from what type of car we would drive, to what range of accomodation we would choose, to what type of friends we would hang out with, etc, etc, and surely and naturally we did just that - settled very comfortably in our wexpat environment. But once in a while we venture out of our comfort zone and into other expats' "environments". And the result? It's always surprisingly pleasant. One such example was watching the Pakistan v.s. New Zealand cricket match in the Cricket Stadium last Saturday. The first thing we noticed was that bad traffic jam leading to the stadium turned a two-lane side street into a four-lane. 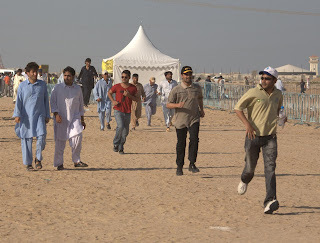 Some Pakistanis opted for parking further away and made up the lost time by running towards the stadium. I can't recall the last time I saw even one person running towards a sporting event, let alone crowds. The enthusiasm caught on me before we even reached the parking lot. I can't quite describe it but the level of dedication and enthusiasm somehow made me respect the Pakistani expats much more so than before. A lot of them may be alone here, they may not earn much, and they may not be able to afford many hobbies, but for what they can manage, they really make the most out of. The cricket match was quite a display of such spirit. I wish I had something more intelligent to say about this boundary-crossing experience, but really at the end of the day I felt truly happy, for the people surrounded me at the stadium were truly happy - and that is something I don't get when walking into the fancy hotel bars of Abu Dhabi. Almost 15 years since I left India, but I still follow cricket (via the web). When I learnt that NZ was playing Pak in AD, I immediately thought of you. But I didn't think you would bother to go to a cricket game. I'm pleasantly surprised and glad to hear you guys went to the game and enjoyed it too.